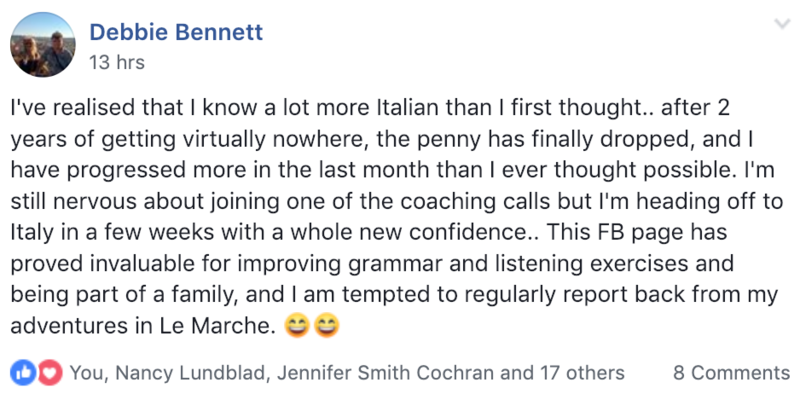 Think it's impossible to go from nothing to speaking Italian in 3 months? So did Lee. He had a deep desire to learn Italian and wanted a program that went beyond rote memorization. 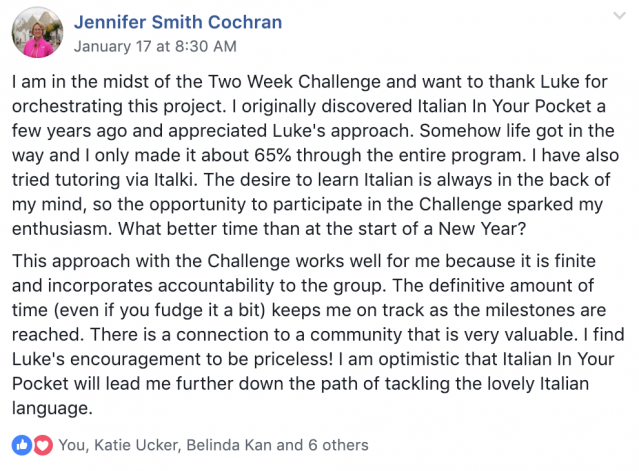 "I took Italian in Your Pocket with Luke and it was one of the best experiences that I’ve had in the past year. It took too much time and effort. I had to spend 8-10 hours a day just to learn a language. It was like having a full-time job. 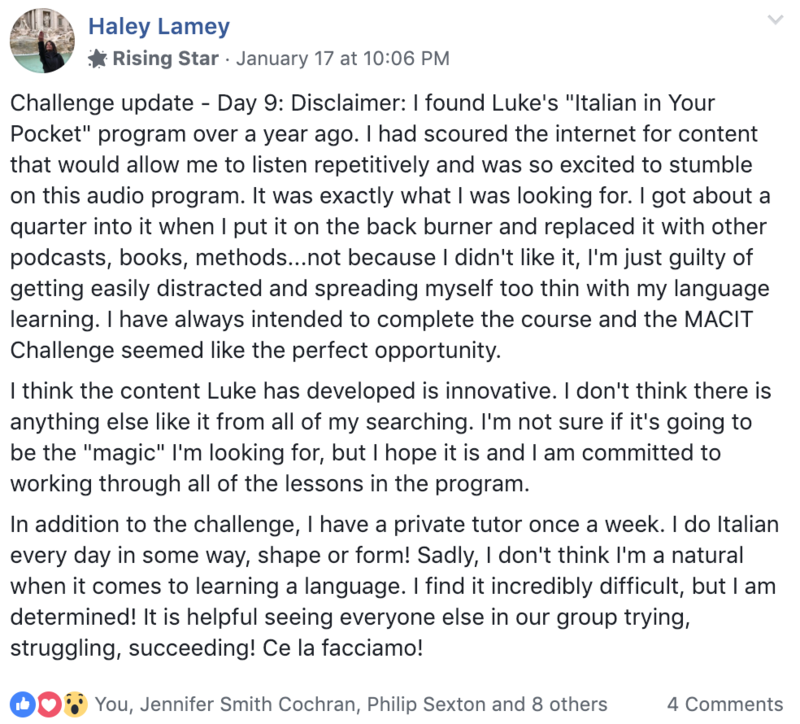 I then spent the next 2 years developing an online program to teach students how to speak conversational Italian in only a few months. Well, there's more to it than that. I developed a process that I call The Repetitive Retention Method. 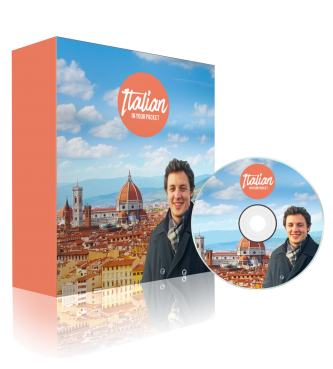 It's a simple 5 step process that helps you quickly understand and speak Italian faster than ever! In this membership, you have everything mapped out for you so all you have to do is follow the steps. You won't search endlessly for material since the membership has everything you need. I've done all the hard work for you. All you have to do is put in a little time each day and the membership and method take care of the rest! "I love having a little community of people to learn with! The Facebook group is great because it helps me feel connected to everyone else, which is important to me (as I'm sure it is for everyone else). I also love all the positivity from you and everyone else in the group! 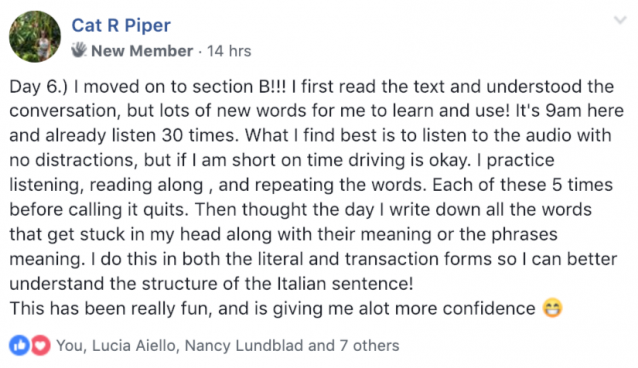 There's a lot that I like about this program :)"
Watch this 6 minute video below to see all that the membership includes and how you can speak Italian in just a few months! Learn how to speak conversationally in different scenarios with confidence for example, how to order from a menu, get a table at a restaurant, organize a trip to the beach, go on a shopping trip, have a casual conversation at a party, and many more! Learn the most used words to accelerate your learning. Every week, you will receive a new lesson! 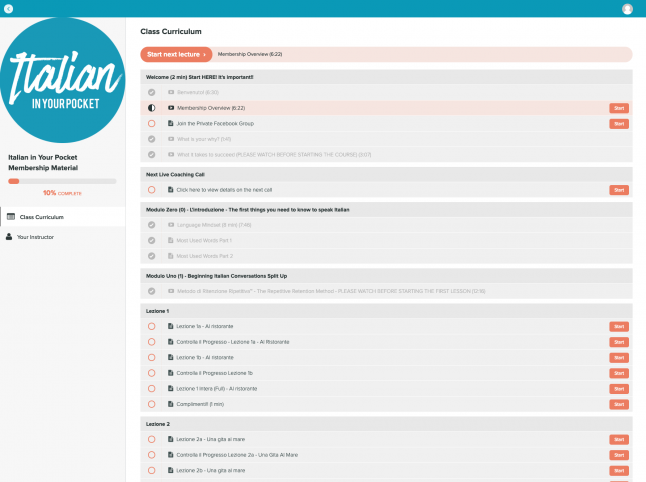 Each lesson comes with an Italian conversation audio as well as a highlighted written script so that you can easily follow along with the conversation. You will also be given the literal and figurative translation of the conversation and other helpful Italian tips. Share your struggles, accomplishments, and love for the Italian culture in our private facebook group! 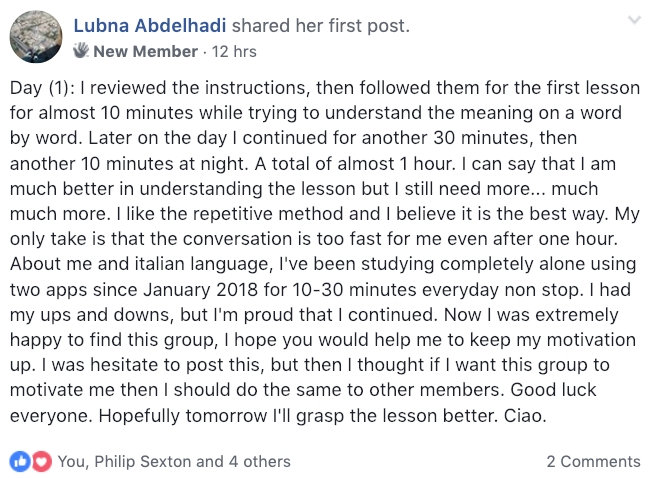 You will be able to share what you learn in a safe environment filled with other Italian learners by posting videos and audio of your progress, sharing how far you have come, and where you might be struggling. 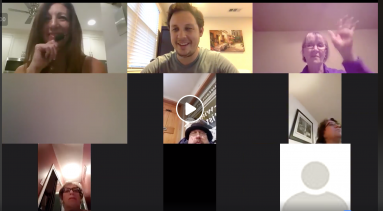 Each week you will have access to a Live Coaching Call where we will go over lessons in the membership, check in with how you are doing and answer any questions you might have. Every month, a lucky winner will receive a fun, free gift from Italian In Your Pocket! 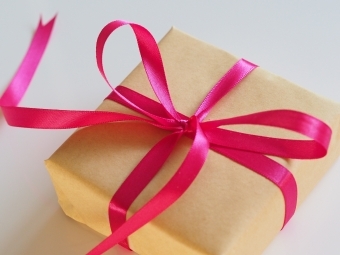 In order to qualify for a gift, you must be engaged in the private facebook group every week and share your progress for each lesson with the rest of the members. 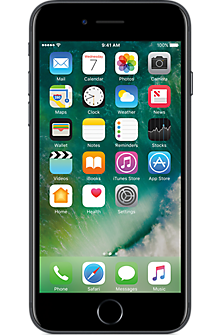 You will get 24/7 access to a Live Group Chat using video, audio, or messaging as you feel comfortable. You will be able to practice your lessons with other students and find native Italians to chat with and exchange conversation in both English and Italian! Each week you will have access to a Live Italian Training Session. In these sessions, we discuss specific Italian topics like language and culture, from a native Italian. When you login, you will have the option to select the membership material, live chat with other members, or recorded coaching calls. The membership material includes introductory videos to help you make the best out of your membership. You will get new lessons each week, but don't worry... you won't lose any previous lessons as long as you are a member so you can continue to review past lessons. The lessons are set up with audio and highlighted transcripts. As you see below, there are two options for the audio (one is a standard conversational speed and the other is the same speed with pauses.) You also have the option to set the audio on loop so that it continues to repeat. The Italian transcript is highlighted with the audio and you can follow along with the literal and nonliteral English Translation. 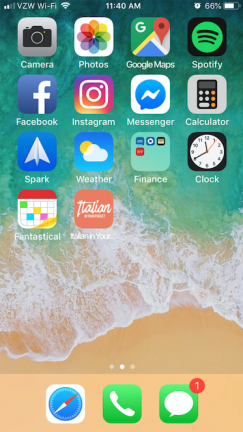 The introductory video will show you how you can create an app on your phone to access the material with ease for those times when you are on the go. From the main page, you can select the Coaching Call option to watch previously recorded Coaching Calls as well as when and where to find future Coaching Calls. 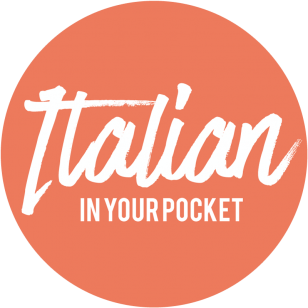 If you're ready to take your Italian to the next level by enrolling in the Italian In Your Pocket Membership, simply choose your payment option below and click the button to join us and start living your Italian dream! NOT SURE IF THE ITALIAN IN YOUR POCKET MEMBERSHIP IS RIGHT FOR YOU? It might seem strange, trying to talk you OUT of becoming a member - but if the Membership is truly not the right fit, then neither of us benefit. We have a vested interest in your success (you won’t stick around long if we’re not helping, right?) - and that all starts by making sure the Membership is right for you before you join. People who consider themselves either beginners or intermediate level Italian learners. People who love traveling to Italy and want to learn Italian so that they can experience the true culture of Italy. People who have a LOVE for Italian! You get access instantly to the Italian in Your Pocket Membership. You can cancel your membership anytime you wish! The first two weeks of the trial will be FREE. After the trial is over, you will be charged the monthly membership fee. The monthly membership fee will be automatically charged every 30 days after the first charge. Any membership cancellations that take place more than 3 days after a payment will not receive any refunds. If you enroll in Italian in Your Pocket by YLanguage, LLC, you are agreeing to this cancellation policy. HOW MUCH TIME WILL I NEED TO SPEND EVERY DAY TO SEE RESULTS? You will need to spend 30-60 minutes a day to see results. If you do less and miss multiple days in a row, it will take longer. Within the Membership, you will have access to our Live Chat Group where you will be able to practice the course material with other students in the course. 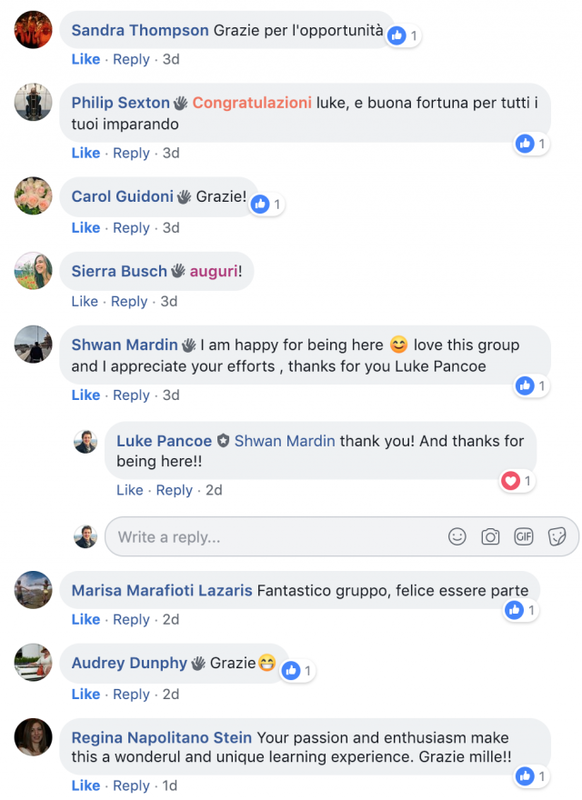 You will also be apart of our Language Exchange Program within the Live Chat Group where you will be able to chat with Native Italian speakers in Italian in exchange for a conversation in English. Please be kind and respectful in the Live Group Chat or you will be taken off. 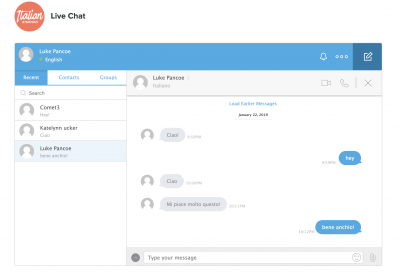 You can use the translation feature within the chat to communicate back and forth if you need assistance. Make sure you are splitting chat time equally speaking in English and Italian with Native Speakers. You will also have the option to add small group coaching calls for an added cost. An Italian teacher will lead you and 5-6 other students through questions and assistance with the course material. This will help you accelerate your journey to speak Italian with correct format and pronunciation. You can always send an email and reach out if you aren't sure about something! You can also ask any questions during our live coaching calls that happen once a week for all members. Because of technology and the way the membership is designed, you can CREATE an environment of immersion using audio provided and doing different techniques discussed in the course.